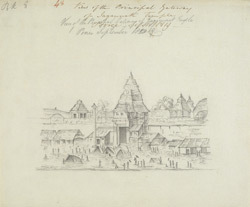 Pencil drawing of the main gateway of the Great Temple of Jagannath at Puri in Orissa, by an anonymous artist, part of the MacKenzie Collection, dated September 1819. Inscribed on front in ink: 'View of the Principal Gateway of Jagannath Temple. Pooree. Septr 1819.' 1819 is probably a mistake for 1820, when the other drawings of Puri were made. Puri is one of the cardinal centres of pilgrimage for Hinduism and is particularly revered by the Vaishnavas as the principal centre of the cult of Krishna in his form of Jagannatha, the Lord of the Universe. The Jagannatha temple is one of the largest in India and was founded in the 12th Century by Anantavarman Chodaganga (r.1077-1147), ruler of the Eastern Ganga dynasty. The temple consists of an enclosed inner sanctuary, covered by a spire (57 m tall) that is richly decorated with figures from Vaishnava myths and topped by the flag and wheel, symbols of Vishnu. This is preceded by a mandapa with a pyramidal roof, surrounded by other mandapas that were added by subsequent rulers. The Rath Yatra (car festival) is the largest annual festival in Puri when the images of Jagannatha, his brother Balabhadra and sister Subhadra are placed in large chariots (raths) and are paraded about the town. The festival is meant to symbolise the journey of Krishna from Gokul to Mathura.